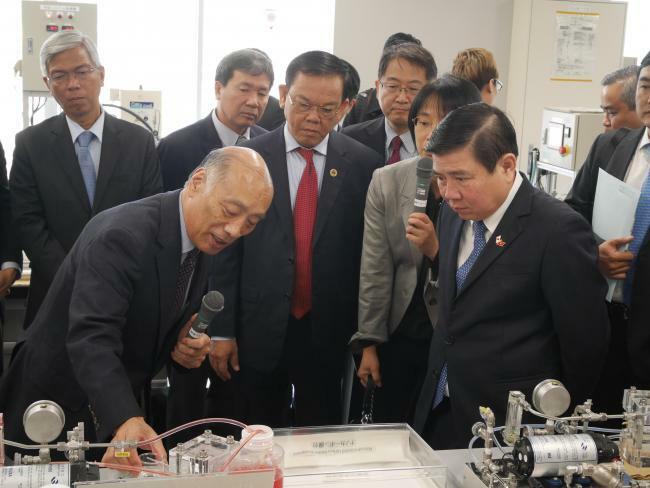 On April 10th, 2018, People's Committee Chairman Nguyen Thanh Phong, Mayor of Ho chi Minh City in Socialist Republic of Vietnam, and his party visited Global Aqua Innovation Center at Shinshu University (AICS) to see the effort of Global Aqua Innovation Center for Improving Living Standards and Water-sustainability (COI). In order to promote further exchanges with Nagano Prefecture in the field of economics and human resource nurturing, the visiting party from Ho Chi Minh City including members of Communist Party Committee and officials in Ho Chi Minh City University of Economics, total 38, visited Governor Abe, companies and universities in Nagano, and AICS. After the visiting party arrived at the Nagano (engineering) campus and enjoyed photography under full blooming cherry blossoms, they moved to the seminar space on the 2nd floor of AICS. President of Shinshu University Kunihiro Hamada, Distinguished Professor Morinobu Endo (COI research leader), and Vice President Kiyoshi Tanaka who is in charge of international affairs gave an explanation about Shinshu University's approach and outline of the COI project. After that, the party visited the COI laboratory with Dr. Endo as a guide to see how the salt water got desalinated. The urban population of Ho Chi Minh City exceeds 10 million people and the amount of water used per day is 1.1 million tons. In addition to the river water, desalinated sea water should be also used as a source of water, but it is costly. In order to accelerate the spread of water desalination, the cost reduction remains a critical issue. "Multiwalled carbon nanotube (MWCNT) -polyamide (PA) nanocomposite RO membranes", which is newly developed at COI and has high toughness and high fouling resistance, has extremely high desalination rate and permeability to enable the cost reduction by 10-15% compared to the existing membranes. The visiting party expressed their expectations and interest in the water desalination technology of COI. 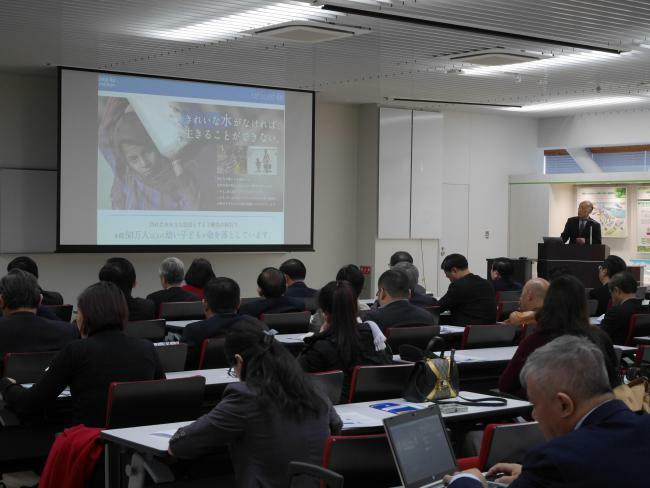 Triggered by the exchange with the visiting party, Shinshu University hopes to deepen further cooperation with Ho Chi Minh City in human resource development and social implementation of a new water circulation system promoted by COI.